IESI is an established leader in Mechanical and Process insulation as well as Environmental Clean up. We are committed to providing our customers with the best service and quality workmanship. IESI was formed in May of 1979 and since that time has installed insulation on chemical, process, refrigeration systems, high and low temperature equipment and ductwork throughout Michigan, Illinois and Indiana. Contracts ranging in sizes of 2 million dollar volume down to less than one hundred dollars on a single project with many of the larger projects being performed successfully on a fast track basis with a large number of skilled employees (50-60) on a single construction site. IESI also designs and fabricates highly technical removable covers for hot and cold systems, equipment, ductwork and industrial sound reduction. We also design and install sound control applications on piping, ductwork and equipment. In the early 1980's IESI, through a partnership with Dow Chemical USA, entered into the asbestos abatement remediation field. We used highly technical personnel and procedures to safely remove asbestos with Dow Chemical Insulation Services. This field of expertise as since advanced into the safe removal of lead, mold and other hazardous materials from building structures. We have been a leader in this industry since its inception. IESI uses advanced training and techniques. Combines with the best safety procedures we can insure that our clients will receive the most cost efficient and quality products available today! IESI is committed to the insulation industry. 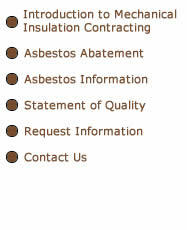 We are active members in Central States Insulation Contractors and the National Insulation Contractors Association. This industry dictates that we maintain a staff of highly trained personnel, knowledgeable in the latest techniques, and performs using stringent safety standards in order to best serve our clients!